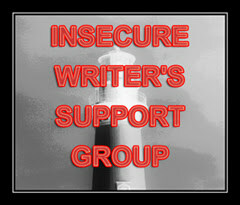 It's time for another entry for the Insecure Writers' Support Group, where writers can share their doubts and insecurities with no fear of ridicule. Go here to sign up and find other participants and please visit our excellent co-hosts for February, Gwen Gardner, Dolorah, Sarah Foster, and M. Pax. Lately I have been reading several posts by well-loved blogger friends announcing that due to time constraints they would need to sacrifice some aspect of their writer selves - blogging, writing, Facebooking etc - even if only on a temporary basis. This is quite a saddening state of affairs, but I know what they mean. In the month of January I didn't get much "writing" writing done, in terms of putting new made up things on a page. Okay, I've done some editing and some freelance writing, but some of this is procrastinating working on the final part of my series. I need to pull my socks up and get down to it. Maybe it is stage fright of coming up with a really good finale. Anyway, my time management problem is compounded by being a little bit stuck, but that will not be the case for everyone. I think what to bear in mind is that if you're going to sacrifice anything, it shouldn't be writing. That's kind of the bare bones of what we do and how we define ourselves. But sacrifice marketing? We all know that even the most sublime stories need a bit of a push if they are not to languish, forgotten. We would probably be better off writing solely for ourselves if we didn't support our own work. So the answer is to keep up both of these pursuits, but how can this be done? A lot of marketing can be labour intensive, like scheduling and writing posts for a blog tour, and you might need to take a week off writing your WIP to focus on that. But that's okay, if you're doing things like character posts and interviews it's still creative writing, and you will probably end up learning even more about your characters. And it's well worth making posts unique and engaging because a handful of buy links repeated time and again is a turn-off. Other marketing pursuits can be done in odd moments, such as sending your book off to a reviewer, or setting up a giveaway on Goodreads. Something I haven't done yet, but which sounds worthwhile, is dropping in on forums and other venues that focus on your genre. It was Christine Rains who pointed out to me the importance of reaching out to your intended audience. Something which tends to divide opinion is Facebook. I haven't set up an author page on there, but as there tend to be shorter posts it might be more time efficient than a blog. After reading this excellent post from Chrys Fey, I'm now giving it much more consideration than I did before. Do you have any time management tips? adopted from Spain, from the same rescue as our dog Tobi, but the family who adopted him have found themselves faced with an exorbitant medical bill through no fault of their own. Please follow the link below to my wife's Crowdfunder page, and if you can spare anything to help Prince it would be hugely appreciated. Time management is always one of my insecurities; it's so hard to find time to do everything you want to. Time for everything is hard to find. I sometimes wonder though if all the blog tours, blogger interviews, and blog posts is the right place to actively "market" a book to readers who are not fellow blogger-authors. I've been writing about time issues a lot lately. But you are so right, writing is the last thing we should sacrifice if we are in a time crunch. Really good point about visiting forums and venues in our genres. I'm not on Facebook or Twitter - I stick mostly to my blog, although I also have a Goodreads Author Page and one on Amazon. There is SO much to do. I wish there was a way to do it all, but until my cloning device is returned... *glaring at the ninja captain* I've also heard that it's best to establish yourself firmly on one or two social media locations and become an expert in those. It definitely makes for less of a headache if you know the medium you're using. Since I'm also the sole provider for my family (with a job that's not very 9-5), I have to prioritize knowing full well that I can't do everything I want done. I'm lucky if I have even just 15 minutes to write, so I try to make it count. Good point. Writing posts for blog tours is also an exercise in creative writing. And it is sad when people cut back and we don't hear from them. It's a tough balance but it can be done. Ha! I'm one of those bloggers! :D But you know, last night I was just telling my mom, who is also a writer, that I wish I wrote back in the day when writers didn't have to worry about web presence and marketing. It would be so much easier! I've managed to create a balance with my blog, FB page, and writing/editing though, so I'm lucky. But...there's so much more that I know I should be doing but I'm not. Not yet, anyway. What an adorable little dog! I hope the family can get help. I am really struggling with keeping up with blogging now. Not just writing the blog but also visiting. Blogging has meant so much to me over the past few years that I don't want to lose it but it's definitely hard to make everything work. I struggle with managing my time. I haven't given up anything in particular yet, but I was never very social to begin with. I'm hoping things calm down after I finish my tour, then I can focus on just writing. I once heard a billionaire give the advice of do a little each and every day. I think that's the best way to handle it. *sigh* time management. I play a lot on social media (okay, really I mostly lurk and read what everyone is up to) but not as much as I used to. I find that FB is an easy way to follow writer friends and see what they're up to. I could be way better at marketing, though. I just wish someone would do it for me, LOL. I have all the time in the world and I still have a hard time managing it! Of course, right now I only have to worry about writing and blogging since I'm not published yet. I think my problem is that I really have to make a schedule for myself and stick to it. It's so impossible to keep up ALL of it. Especially for people with a dayjob or other full-time commitment (small kids not yet in school). It is why I've finally decided that in spite of it taking longer, I need to go traditionally. I HAVE TO write, so something had to go--all that placement, formatting etc. made the most sense since it is the one area that is sort of optional. I know what you mean about time management. It's all a vicious circle. About the Author Page on Facebook. It would be a great tool if FB didn't keep the majority of the 'likers' from seeing the posts. Another author friend made a Group Page instead, calling it a Reading Room. This way, everyone in the group gets the same messages as long as their notifications are on. It may be worth looking into both forms. I had a post on Facebook in response to a recent post I did on author websites. She said your readers want you writing them stories, not blogging, so writing should come first, blogging second. I'd say that is true for all social media pursuits, but there has to be marketing, too. So much to fit into so little time. Time management is currently a struggle for me . . . so any tips are always appreciated! I like the idea of dropping in on forums, which I also haven't done, and I found Chris' post on facebook strategies to be very helpful! Best wishes with your writing and best wishes for Prince! I've been away from writing for almost 2 years because of time management issues! Now I need to write as an outlet. I feel very rusty about everything and it's going to take awhile to get the wheels churning again. Best wishes with the fundraiser- I wish I was rich! I'm going to be on my blog less but will not be slowing down on Facebook. Like you say, less time. Good for you for sharing info about the adopted puppy. Great tips! Time management is something I struggle with constantly, and I think my poor, neglected blog reflects that, haha. Been trying to get better, but it can still be hard to find the right balance! Time management is one of those things I don't think I'll ever master. Thanks for the link to Chrys Fey's post about Facebook author pages. I've been going to make one and hadn't yet, so it's very helpful! I've not been terribly successful at juggling all of the balls, especially when I'm in FULL BORE DRAFT mode! The only advice I can give is experiment until you find a balance you can live with. There is no optimal solution that satisfies all of your wants and needs...so look for a compromise that you can live with. Time Management is the necessity of the current world scenario. You need to keep up the task, multi-task and also ensure that nothing is neglected andalways try to have a new task added to your routine every single day! Writing is a commitment. I try to write everyday, even it's only 45 minutes (time management is a huge challenge for me). I find it adds up, but I wish I would have taken this approach years ago. BTW thanks for the encouragement at my blog! Donna writes my question: do blog tours help anymore? I don't Facebook much and Goodreads is so snarky that it does not tempt me to place a target on my back! I tweet occasionally, but try not to emarket there all the time. Just a joke or a nice quote or a fun photo. I pray many give to Prince's bills. Pets can cost so much these days!! I actually found that once you're published, your publisher will sometimes hold off on purchasing another book to let you "focus" on marketing one that had just come back. For me, I'd rather put anything else on hold but writing...but I understand a publisher's reluctance to buy until they see how the current one does. So hopefully all my over-blogging and giveaways have helped because all I really care about is that I get to keep writing!!! I've given up managing time. I let it manage me. When I'm totally behind, which is pretty much everyday, I take a walk. Time seems less relentless when I'm walking the trails. I hope Prince gets the support he needs. Your very kind to help him out. Oh, time management is SO not my strength. I try to do it all: writing, marketing, socializing, critiquing, reviewing, etc. But something always suffers, and it's usually my blog. I had such good luck with Goodreads, you should definitely give a giveaway a try.